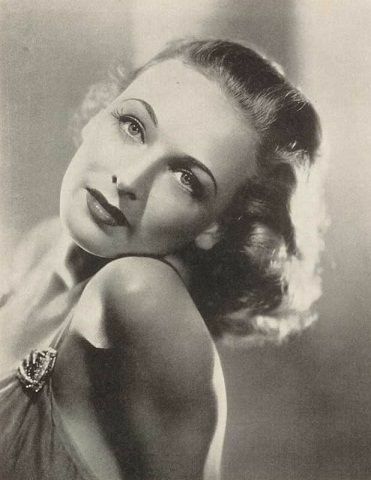 Ann Evers was beautiful, a trained actress, talented and with a ferocious will to succeed. So what went wrong? Unfortunately, this is the million dollar question nobody can quite answer. Let’s learn more about the lovely Ann! Ann Evers was born as Ann Marie White to John Belvin White and Mary Etta Thomas in North Carolina in 1916. IMDB lists her birth time and place as September 9, 1915 and Scranton, Ohio, but the place is almost certainly false – I also wonder if the date correct. Her siblings were: William, born in 1913, Lilly, born in 1919, and Rose Helen, born in 1923. Her family made a series of moves in 1920, and Ann and her siblings grew up first in Roanoke, Virginia and later Clarksville, Virginia, where she attended high school. After graduation, Ann studied at the New Orleans Conservatory of Speech and Dramatic Arts and later graduated from the New York Academy of Dramatic Arts. 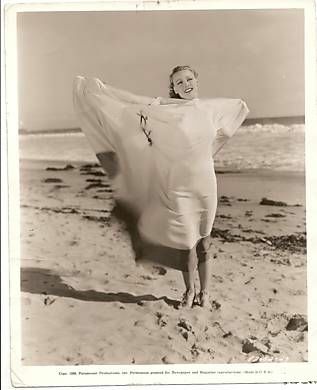 Ann started her way to Hollywood one day in late 1935, and only because she always read the newspapers. No matter where she was Ann insisted on having a daily newspaper each day and she read nearly every paragraph in it. That is how she found out through a three-line personal item that Ben Piazza, the famous Paramount talent scout, was to be in New Orleans while she was visiting there. She had just graduated from the Academy in New York City – armed with looks, talent and determination to succeed, she went to call on Ben Piazza at his New Orleans hotel, and when she left his room she left it in style – with a contract and a ticket to Hollywood. Let’s be frank, if Ann is to some degree remembered today because of the lo-budget westerns she made. Since you all know how much I appreciate and love such movies, let’s just get on with it: she was in Wells Fargo, Frontier Town and Riders of the Black Hills. Now let’s get it on with the rest of her career. She started her odyssey with Too Many Parents, a juvenile movies with members of Our gang shorts playing military cadets. Then she appeared in the okay but completely forgotten Florida Special. Boy, if Florida was forgotten, her next movie, Heliotrop, is even more so (it doesn’t even have 5 ratings on IMDB, and you know what that means!). Ann’s next feature was A Son Comes Home, the type of movies they don’t do anymore – small-scale, intimate, warm and exceedingly simple in plot (as the title says, it’s about the homecoming of a long-lost son). Actors are everything here, and they have struck gold with a veteran cast of Mary Boland and Charles Hoffman, and a new, fresh-faced cast of Julie Haydon, Donald Woods and Wallace Ford. 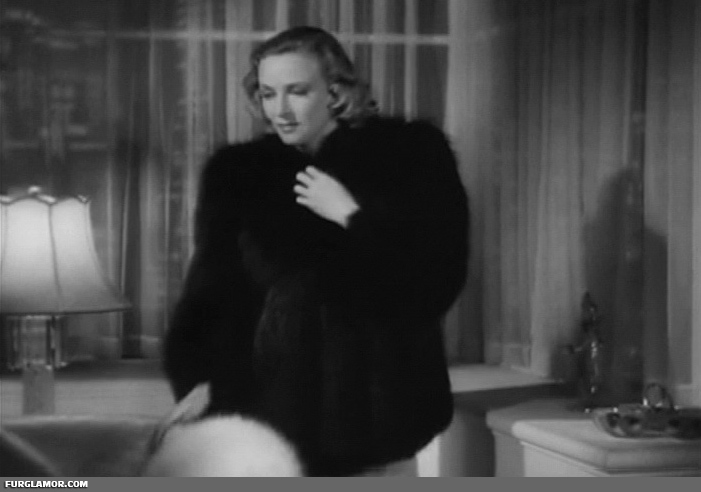 Then came My American Wife, completely forgotten despite the solid cast (Ann Sothern, Francis Lederer). Next we have Hollywood Boulevard, an interesting expose of gossip sheets way back in the 1930s. While it’s not a particularly good movie (very badly edited! ), the plot is above average and manages to pull the film above the watching threshold. Also a true treat for silent movie lovers – many stars of yesteryear have small roles! Afterwards, she returned to mainstream movies with Marie Antoinette, the legendary Norma Shearer/Tyrone Power epic. She continued in the same vein with If I were king, an absolute winner with Ronald Colman as Francois Villon. It’s a perfect adventure classic movie – witty script with some depth, great action all around (Basil Rathbone and Ronald Colman), and capable direction. A must watch. Ann finally got a sizeable role in The Mad Miss Manton, a somehow lackluster mystery-comedy with Babs Stanwyck and Henry Fonda in the leads. Considering who’s acting, it’s not a particularly good movie – so sad! It could have been a classic! Ann’s next movie, Next Time I Marry, was another thin screwball comedy. Mind you, these movies weren’t drop dead bad, just not as good as they could have been. Here we have Lucille Ball playing an heiress who wants to marry a penniless gigolo but due to her father’s will has to marry a plain American guy. And try to guess who the story goes from here. James Ellison plays the plain American guy and he’s actually pretty good in it. Some laughs but as I said, it could have been better. Ann changed gears a bit with Hawk of the Wilderness, a typical Republic adventure serial with Bruce Bennet in the lead. Compare this to her next movie – the well-regarded Gunga Din! Jumping high aren’t we? This remains Ann’s best known movie, a staple of all classic adventures movies. Why? As one reviewer noted on Imdb: It has everything – a good script, a good story, epic sweep, fantastic acting, inter-character chemistry, charisma, pacing and coherency. And Cary Grant thrown into the equation. Whozza! Ann’s last movie for RKO was Beauty for the Asking, a below average comedy elevated by a great female cast – Lucille Ball, Frieda Inescort, Inez Courtney. The plot is a bit idiotic: (taken from a review at IMDB): Lucille is the inventor of a cream she is sure will revolutionize the beauty industry. It all happens after the man she loves (Patric Knowles) marries a member of the upper-crust (Frieda Inescort), breaking her heart. She peddles her product to a manufacturer (Donald Woods) who finds an investor in none other than Inescort. The romantic tensions re-arise between Knowles and Ball as they become re-acquainted, and Lucy, who has come to find Inescort to be a good friend, struggles to do the right thing. Five writers tried to polish up the script, and ultimately it’s not a bad piece of writing but it lacks the bite and the finesse to be a truly succesful comedy script. Happily, Lucille went on to bigger and better things later in her career. Ann, sadly, did not. She acted on the stage for the next couple of years. Ann returned to moves in 1942 with Monogram Studios and Police Bullets, an unusual B movie about a man with photographic memory and a bunch of hoodlums trying to use his special talents. Alas, the short leashed budget and uneven acting performances ruin an otherwise promising little movie. She they played a bit part in a forgotten short comedy, Two Saplings. Equally forgotten was her next feature, She Has What It Takes, a Jinx Falkenburg vehicle. Her last movie was the touching Someone to Remember, a slow-moving drama about an old lady whose son was lost long ago, and how she bonds with young students. What to say, vintage weepie Hollywood! Ann gave up movies for a time afterwards to act on the stage again. Ann made only one more movie, Casanova Brown, a Gary Cooper film, before retiring for good. Ann was 5 feet, 6 inches tall; weighed 122 pounds and had blond hair and blue eyes. Off the screen her hobby were clothes. She designed many of her own gowns and always appears as though she had just stepped out of a bandbox. Ann’s first Hollywood beau was William “Bill” Hopper, son of Hedda Hopper – they started dating sometime in April 1936. They went to town often and were seen dancing in various nightclubs. He nursed her when she got intestinal flu and had to stop working on a picture she was making. In November 1937, William put an engagement ring on Ann’s finger. Both are 22 and seemed to be more in love than ever. 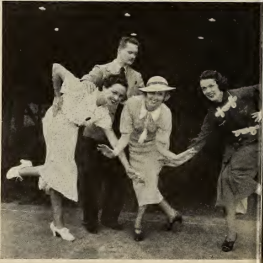 To make things ever sweeter, that year Ann and Wilma Francis, two recruits to the Paramount stock school from New Orleans, had their options extended for another term and were to be groomed for roles in forthcoming productions. Both girls received dramatic training under Phyllis Loughton. And then, it all went wrong. Ann and Billy broke up and she lost her contract with Paramount. Such is life in Tinsel Town. August 1938 – Vic Orsatti and Ann Evers are cooing. Vic dated about a gazillion other girls, so it was pretty obvious this was more for fun and less for commitment. Ann was also pursued by handsome Conrad Nagel later the same year. They Must Improve Their Bridge Game: Frances Mercer, Ann Evers and Whitney Bourne had to confess recently to Director to Director Glenn j Tryon their inability to play an important movie scene at a bridge table. Tryon had to summon Charles J. Fordham; professional player and coach, to teach the three starlets! Ann also gave a beauty hint to her readers: She often wears an oiled silk kerchief to protect her hair on rainy days. Keep one in your pocket for sudden showers, it may save your head. Handy, have to admit. In early 1939, Ann and Bill Hopper reunited, and by August they were a sure bet for matrimony. Bill was also with her when she had to wear false eyebrows when her own were singed off by a gas stove explosion. One of her hands was also burned. Unfortunately, something happened and they never reached the altar. Too bad, they looked like a fantastic couple (at least physically). In 1942 Ann and Danny Winkler were the newest twosome. They met at the marriage of Irene Colman and Bob Andrews, but unlike Irene and Bob they didn’t make it anywhere. 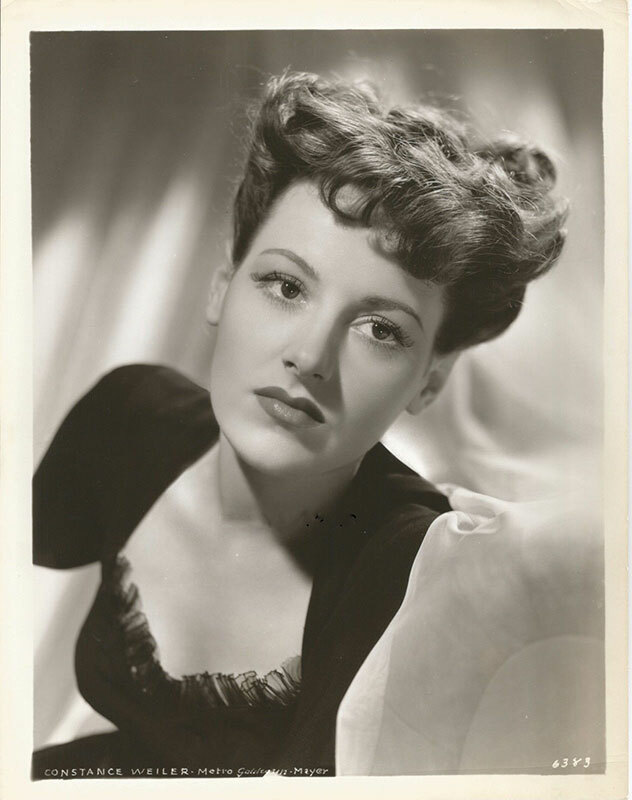 By mid 1943, she was feted by George Jessel (along with dozen of other girls). She la Ann Even, blonde, blue-eyed and shapely, who came here in January, 1936, seeking a career. When she left New York she had $400. She also had a six months’ contract with Paramount at $50 a week. Ann saved at least half and sometimes all of her pay during that contract, learning that in movieland you may always expect the worst. It came, for she. was dropped at the end of the contract. Then for nine long, months she didn’t get a single stroke of work. The money eased away, She couldn’t buy any clothes. Then she got two weeks work posing for Russell Gleason and a week and a half playing the lead for an independent studio, For all this she received an average of $250 a week, the biggest money she ever had made. Then came another three months of pounding the pavements from casting office to casting office without result. When she was again on the verge of despair she was given the lead in a western picture by another independent studio, getting $200 a week. The only trouble was the picture was a one time only. She then got a different kind of opportunity. For a month now Ann has been inclined to jump at noises. Her appetite has failed at times. Bad dreams disturb her sleep. She may be climbing mountains, where rocks teeter on the edges, or she may be on a train speeding toward a precipice. She wakes up and shivers and pulls the covers over her head. She is going through the mental inquisition which comes sooner or later to every girl just on the brink of fame and fortune. It comes at the same point in their careers, the moment after ups and downs, with sometimes hunger thrown in, when they are waiting for a decision on their contract options. Working under a specific agreement with RKO for the one picture, Ann finished her best role to date, with Barbara Stanwyck in “The Mad Miss Manton,” a month ago. Whether the option is picked up, which will mean a good contract and a major step up the ladder, depends on how her performance is greeted by a preview audience at the end of this week, The studio has 30 days after th preview to make its decision. And so, for what may amount to a two-month period, Ann, like many ambitious girls before her, waits and hopes and grows more nervous over the outcome. As you can see, it truly was nerve-wracking and not for the faint of heart. The more I read about it, the more I can understand how such lovely girls like Gail Russell ended up alcoholics before they hit their 30th birthday. Seton Ingersoll Miller (Chehalis, Washington, May 3, 1902 – March 29, 1974, Los Angeles) was a Hollywood screenwriter and producer. During his career, he worked with many notable American film directors, such as Howard Hawks and Michael Curtiz. A Yale graduate, Miller began writing stories for silent films in the late 1920s. In the 1930s, he tended toward the crime genre, collaborating with Hawks and others on one of the most groundbreaking of such pictures, Scarface (1932). At the time of the Production Code’s enforcement in 1934, Warner Bros. called in Miller to supply the dialogue and storylines they needed to adapt their pre-Code bad-guys to the new system. His scripts for G-Men (1935) and Bullets or Ballots (1936) successfully transformed big screen gangsters James Cagney and Edward G. Robinson, respectively, into crime-fighters. With Norman Reilly Raine, Miller wrote the script for The Adventures of Robin Hood (film). Often he adapted popular plays or novels, as with Graham Greene’s Ministry of Fear for Fritz Lang’s 1944 film. He worked regularly in Hollywood until 1959, when he helped write the thriller The Last Mile, but then left the industry for more than a decade. In his seventies, he made a brief return, providing screenplays for a horror film, A Knife for the Ladies, and for Disney’s Pete’s Dragon. However, there was a catch. Miller was already married, to Bonita Nichols – they wed on 1927, and had two children – a son, Keith Stanford, born on October 31, 1928, and a daughter, Bonita Anne, born on March 6, 1936. I can’t find out if they were divorced by 1944. Before you ask if is it important, I think that it was very important for Miller and Ann back then, because their only child, daughter Catherine, was born on July 14, 1945. And Ann and Miller got married on January 26, 1946. Full five months after their daughter was born. That was back in the 1940s, where people didn’t have children out-of-wedlock often. So, while I can’t be 100% sure, the timeline is as it follows – it seems that Ann and Miller were involved before he was divorced, she got pregnant, they had to wait for his divorce to come through, and that is why Catherine was born prior to their marriage. The papers first caught something in May 1945, when a heavily pregnant Ann left off to New York, and Seton went to meet her there. No mention of her pregnancy or anything else. Now, something about the marriage. They married in Montecito and had to postpone their honeymoon until Seton completed his picture-of-the-moment at Paramount. Afterwards they went on a six-week trip to Mexico City, Nassau and the Bahamas. During a portion of their honeymoon, they were guests of Ernest K. Gann, pilot and author, on his schooner in the Caribbean. Ann retired from movies to dedicate herself to family life. Seton died on May 29, 1974. I have no idea what happened to Ann afterwards – IMDB claims she died on June 4, 1987 in Edison, New Jersey. I can’t vouch for that 100%. Whatever happened, as alway,s I hope she had a good life. Gail Elizabeth Goodson was born on August 10, 1916, in Denver, Colorado, to Galen Roscoe Goodson and Ethel Ulmer, their only child. Her father was born in Hopkins, Missouri, and was a graduate of the University of Denver, working as a dentist. For the first ten years of Gail’s life they lived in Denver where she attended elementary school and was active in winter sports. The family moved to Los Angeles in 1927, and Galen quickly found his niche in the local dentist trade – he became a favorite among movie people. Gail grew up in affluence in Beverly Hills (she was part of the Los Angeles genteel society and often attended soirees and tea parties), and attended Los Angeles High School. So, how did Gail, who had no show biz aspirations, end up an actress? Well, her father was Eddie Cantor’s dentist and her smile won her the Eddie’s notice when he visited the office one time. He had seen her the year before, and she seemed just a little girl, wearing some of her dad’s teeth straightening gold bands. He then left Hollywood and some time, and when the comedian returned, he saw Gail on the day she graduated from high school in 1934, and was so Impressed by her radiance and grown up appearance that he got her a screen test with his producer, Sam Goldwyn. She passed with flying colors and became an instant Goldwyn girl! Gail made her movie debut in the legendary Kid Millions, where so many starlets acted as Goldwyn girls. The plot goes like this: Eddie plays a New York barge boy, who inherits an Egyptian treasure from his archaeologist father. Once in Egypt he is surrounded by a bevy of con artists both male and female, who try to get their hands on his money. And the story is perfect backdrop for Eddie’s unique brand of talent, and for some major musical stars to show off their prowess (watch out for Ethel Merman, Ann Sothern, Nicholas Brothers, Doris Davenport and so on). Pure enjoyment without much brain work, it’s a great Depression era musical. Gail’s second movie was Folies Bergère de Paris, a delightful Maurice Chavalier comedy. It has an outstanding cast – Maurice, Merle Oberon, Ann Sothern, a funny and simple story (you heard it a hundred times before – An entertainer impersonates a look-alike banker, causing comic confusion for wife and girlfriend. ), and good dancing and music. What more do you need? Next Gail appeared in an Our gang short, The Pinch Singer. It a minor and forgotten effort, more or less. As she was Cantor’s progetee, she appeared in the last movie Eddie and Sam Goldwyn made together – Strike Me Pink. It’s an uneven effort, to say at least – much of the movie is ponderous and repetitive, and then the last 20 minutes turn into a top class farce, the best of what Cantor had to offer. The plot is pretty simple: meek Eddie Pink (played by Cantor of course) becomes manager of an amusement park beset by mobsters. Throw in some stalwart performers like and Ethel Merman as his leading lady, and you have a good cast if nothing else, and some great dance numbers with the Goldwyn girls (of which Gail was a member). And then Gail left the screen to marry. Unlike many actresses that try to give up, Gail had her biggest claim to fame /(which isn’t saying much), in 1948, when she appeared in Joan of Arc – as Ingrid Berman’s armor double who did all the stunts! Incredible! I never tought that Gail had it in her to become a stuntman. Anyway, this is the movie people will remember from Gail’s filmography, and while it’s far from being the best movie made about Joan of Arc (you should watch the stunning silent movie, The Passion of Joan of Arc), it’s actually a solid historical epic. It was directed by Victor Fleming, who also helmed Gone with the wind, and of course it’s a lesser movie (but it’s not fair to compare any movie with GWTW), but Ingrid Bergman is simply outstanding and gives one of her best performances – and she had so many of them! Also the supporting cast is pretty impressive too (J. Carroll Naish, Ward Bond, Gene Lockhart…). That was it from Gail! Laughter is one of the brightest things in life. It may make wrinkles in time, bu they’re pleasant wrinkles and won’t detract from the charm of the wearer. GLASSFORD SON WEDS ACTRESS: Gail Goodson, screen actress and daughter of Los Angeles dentist, taken as bride by Guy Glassford, son of Washington Police Chief who came to national attention in connection with bonus march. Gail Goodson becomes sis Bride at Agua Calienle. Gail Goodson, 18-year-old motion-picture actress, and Guy Glassford, 23, son of Brig.-Gen. Pelham D. Glassford, were married yesterday at the Hotel Agua Caliente, Baja California, according to advice received here last night. The couple flew to the Lower California resort early yesterday. The bride is the daughter of Dr. and Mrs. Galen R. Goodson, of 100 North Sycamore avenue, and was graduated last year from Los Angeles High School. Guy Carleton Glassford was born on November 8, 1912, in New York City, to Pelham and Cora Glassford. As noted, his father was a police chief. They moved to Texas and then to Los Angeles. He worked as a credit manager for a living. The Glassfords lived the high life in Beverly Hills, but the marriage did not work out and they divorced in about 1938. Glassford remarried to Utah native Marjorie Robinson, had a son, and died in February 1974 in Denver, Colorado. Mr and Mrs. Goodson announced the marriage of their daughter Gail to W. Donald Burgess last evening. Dean Ernest Holmes officiated in the presence of about 60 guests. The bride was gowned in ice blue meline with bouffant skirt and satin bodice. Her veil of royal purple meline was held in place by a headdress of fresh violas and violets. She carried a muff of violets and purple orchids. Mrs. J. Francis Gaas, as matron of honor, was in gray chiffon with a headdress of gray tulle with pink roses and delphinium. She carried a muff of the same flowers. Frederick Kessler served as best man. Burgess was born in Canada in 1912 but moved to the US with his parents in 1922. He worked as a planter Tendant Supervisor. The marriage did not last long and they divorced in about 1945. Burgess became a naturalized citizen of the US in 1948 and died in March 26, 1978. Gail Goodson Will Be Bride of New Yorker Dr. and Mrs. Galen Roscoe Goodson of Beverly Hills announce the engagement of their daughter Gail to Alfred Hance Savage of New York, son of Mrs. Harlow Dow Savage of Scars-dale, N.Y., and the late Mr. Savage. The wedding Is planned for May at the Savage estate in Scarsdale. The newlyweds will make their home in New York but plan a honeymoon trip to Los Angeles. At that time Dr. and Mrs. Goodson will entertain at a reception in their new home, 1122 Calle Vista, Beverly Hills. Alfred Savage was born in 1911 in Kentucky, to Harlow and Edna Savage. He graduated from Phillip Exeter Academy and moved to New York. He worked as a manager of personnel relations for The New York Daily News. The couple lived in New York and had two daughters, Galen (born in 1949) and Clinton (born on December 15, 1950). Gail became a founder and first president of the Bronx­ville Committee of the National Mental Health Association, and was very active in the Youth Consultation Service and Reach‐to‐Recovery, an organization for women who have undergone breast surgery. Gail Goodson Savage died from cancer on June 28, 1964 in New York City. Gail’s widower Alfred Savage died on January 19, 1982 in Florida. Sometimes, we want our actresses not to be cute girls next door like Rosemary Lane or Teresa Wright, but full-blown, over the top divas. Someone like Bette Davis or Gloria Swanson. Well, Wilma Francis was a diva. She was flamboyant, did things her own way and dated men by the bucket-load. Unfortunately, she never achieved a level of fame to make her comparable to other well known divas, but it seems she sure had a fun life! Wilma Francis Sareussen was born on November 26, 1917, in New Orleans, Louisiana, to John Sareussen and Frances Eleanor Ader. Her father was a wealthy ship chandler but by no means was he a true Southerner – he was born in Norway. Her mother did come from an old Louisiana family (think Scarlett O’Hara!). Wilma’s older sister Elinor Marie was born on December 10, 1915. The family resided in New Orleans, where Wilma grew up. After graduating from high school, Wilma attended Tulane and Loyola universities, studying journalism. Now, how the story goes from here makes little sense – she, daughter of a prominent family and educated in top schools, while a student, ended up in a typing pool in an insurance company office in New Orleans. What?!! Anyway, this was the story she later sold to the papers, so I don’t know if this is true or invented, but why did they have to invent it anyway? Cinderella syndrome? Anyway, Wilma landed in Hollywood because a scout for a film company (Ben Piazza) spotted her when she was working in the office of the insurance company, and signed her with Paramount. Wilma made her debut in Florida Special, a run of the mill crime movie with Jackie Oakie as a worldly journalist trying to stop a train robbery. Yawn! been there, seen that at least a hundred times… Her next movie, And Sudden Death, was hardly any better – featuring Randolph Scott and Frances Drake, it was a cautionary tale about traffic and speeding. As it usually happens in much films, traffic cop falls for a young woman who simply drives too fast… Blah, blah.. It goes into overt dramatics too soon and becomes a sappy, low budget miss. It’s a shame, since the topic of driving too fast and too furious in traffic is very relevant today (and boy, so much!). Wilma finally snagged a credited role in Lady Be Careful, but the movie is so utterly forgotten today there is nothing I can write about it. next. The same goes for her netx movie, Hideaway Girl. 1937 started a bit better for Wilma – her first movie of the year, Bank Alarm, was a bland and uninspiring film about G men fighting against a group of bank robbers, but at least the movie left the smallest of traces for prosperity. 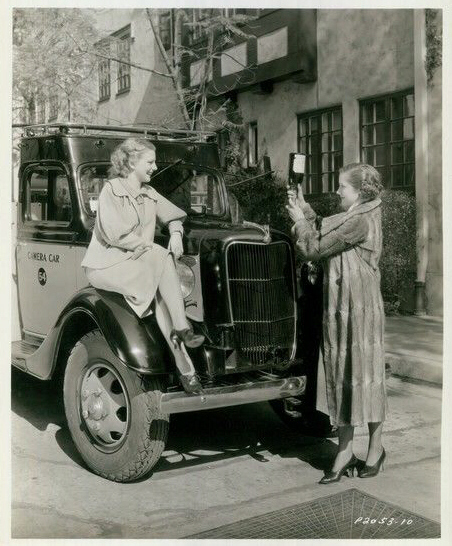 Unfortunately, this did not mean further career enhancements for Wilma – she spent the rest of 1937 far from the movie cameras, and only came back in 1938 with Trade Winds, a witty, sparking and elegant screwball comedy, with a top-notch cast (Joan Bennet!! Fredric March!!) and more than one twist to keep you occupation. 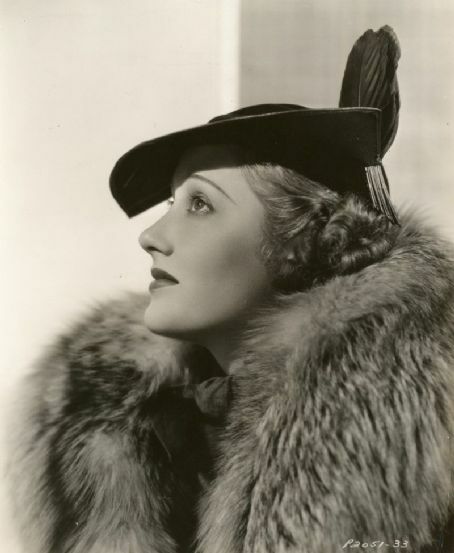 Wilma then left Hollywood for a short time, returning in 1940 to make Stolen Paradise, where her then husband, Leon Janney, was playing the lead. Unfortunately it was directed by the king of camp, Louis Gasnier, who ably helms it into “bad acting and bad script territory from scene one. The story is not half bad, and actually pretty deep in some aspects – a young man who wants to become a priest falls in love with his step sister and does not know how to deal with his emotions – it really sounds good, but the execution is awful. Skip! Next came the only slightly trashy Under Age – yep, as the title suggest, the girl here and pretty, nimble and under age. It’s an early movie by future legend Edward Drmytryk, but boy, while he does show signs of brilliance, it’s still way too much. The muddled plot is a hotbed of complicated feelings, bratty teens and love triangles. Skip. Wilma’s last and best movie from this batch was Borrowed Hero, a more than decent B programmer about a lawyer who after a stint of bad luck finally hits the jackpot – and how his life unravels afterwards. Florence Rice is in it – a plus for sure! In the 1940’s she worked for a while as an assistant to director Sam Wood’and made her last billed appearance in a motion picture in Wood’s 1945 film Guest Wife. She then did some TV work (which I will not go into any detail), and appeared in minor roles in two more movies – Hotel and Airport. And that was all from Wilma!! While in Hollywood, in her spare time, Wilma builds boat models. She revealed to the press that she learned the craft from her father, by then a retired naval officer. One of Paramount’s younger players, Wilma Francis, has the most interesting antique bracelet in Hollywood. It is a family heirloom and has been handed down for many years with a legend which traces back to Cellini’s days when the piece of jewelry is supposed to have been made by this famous master. It is of dull gold with a floral tracery which has been filled la with black platinum. The design resembles a wide leather strap with a buckle and the bracelet has a safety clasp which is held with a fine golden chain. Wilma started dating Conrad Nagel in August 1936, and their relationship blossomed nicely in the comings months. Already in November of 1936 there were rumors that they might wed. She told the press: “Conrad is the dearest person in Hollywood. We are constant companions. Of course, I am only 18 I’ll be 19 on Thanksgiving day. And Conrad is 37. Marrying him wouldn’t hurt my career.” However, there was a lull in the fairytale when Paramount refused to renew her contract Wilma used the opportunity to visit her mother. At the train to bid her farewell was none other than Conrad Nagel. The trip sparked a “finis” to their romance because at the time Wilma was doubtful whether she would return again to resume her career. However, Wilma returned to Hollywood, but not to Conrad. After a brief fling with director Wesley Ruggles, from March until May 1937, she dated noted novelist B. P. Schulberg. After she ditched Schulberg, she resumed with Conrad for several months in mid to late 1937. Again, there were rumors of their impending nuptials. They dated, on and off, for more than a year, breaking up in December 1938. In the interim, Wilma dated Latin charmer Antonio Moreno. In early 1939, Wilma took up with Leon Janney, juvenile actor. They were married in March of the the same year, although they kept the marriage a secret from the press for at least four months. Janney was born on April 1, 1917 in Ogden, Utah. He started acting in earnest in 1927, when he was 17 years old. He was very active until 1932, and afterwards he got into the theater, where he met Wilma. They were all lovely dovely until June 1940, when something bad happened and they separated in August – they reconciled in September and tried again. This was a flop also – they separated again in October, tried to patch things up but were kaput by December 1940 and started divorce proceedings early in 1941. Wilma charged cruelty (she charged he threw a pack of cards at her during a bridge game) and they got their final decree in May 1941. Janney remarried twice and died in 1980 in Mexico. After this unfortunate accident, Wilma returned to Los Angeles in December 1946, but by January 1947 she was bedded, with a nervous breakdown, probably due her involvement with Collins. By May, she got her groove back and was beaued by Dane Clark. Later in the year, she was seen with comedian Lew Parker. In May 1949 there were rumor she’s hot going to altar-trek with Stacy Harris, star of radio’s “Your F.B.I.” Unfortunately, they were just rumors, and Wilma did not wed Stacy. In May 1950, she was pursued by actor Eddie Norris. On September 29, 1951, Wilma married Roger Valmy. Valmy was quite a colorful character. Born in Egypt on October 1912, he moved to Paris with his mother and was a horse racing champion before the fall of Paris during WW2. He moved to the US and started a highly successful real estate agency in California. He was married once before in 1943 to Ruth Ownbey, a model and starlet. Later he dated and was very serious about heiress Barbara Hutton. Wilma and Roger lived the high life in Beverly Hills, as she was Southern royalty and he was a wealthy and highly charming real estate tycoon. Unfortunately divorced after less than two years of marriage in mid 1953. After he and Wilma divorced, Roger was married two more times – the first time was to Margarett Smith in the early 1960. They divorced in 1972 for the first time, remarried in 1974 and divorced not long after in 1976. In 1977 he was married to his last wife, Dana Kathleen Bond. He died in 2004 at the age of 92. In May 1958, she got into newspaper again, but not for a nice things – she changed four charges, including kidnaping, against a Gretna, La., policeman as the result of a fracas at a ferry landing there on April 2. Miss Sareussen, who used the name Wilma Francis in the movies, filed the charges with Justice of the Peace L. L. Traught of Gretna against Policeman Alvin Bladsacker. Gretna is across the Mississippi River from New Orleans. Miss Sareusson makes her home in New Orleans. She charged Bladsacker with assault and battery, kidnaping. false imprisonment and unauthorized use of movable property (her car). I could not find any more information about the case, so let’s assume it just let it flow. Wilma completely falls of the radar from then on. What we do know is that she worked as a casting director for films and television productions shot in her Louisiana during the 1980’s. Wilma Francis died on June 23, 1991, in Metairie, Louisiana. Unfortunately, there is a shortage of information about the lovely Constance Weilver, and this is going to be one slim post, so bear with me. While I dislike writing short posts, I fell in love with the above photo of Constance, and I just had to profile her. So let’s learn more! Constance Ellen Uttenweiler was born on September 17, 1918,in Toronto, Canada to Lebret Joseph Uttenweiler and Mable Wilson. Her older sister Bernice was born on May 11, 1917. Her younger brother Robert would be born in 1921. Her father was American, born in Michigan, her mother was a Canadian. The family lived in Toronto, where Constance spent her early years. On April 30, 1927 at the age of 8 she immigrated to the US with her parents, arriving in Detroit by boat. They went to live with their paternal grandfather, Robert Wilson, in Detroit, Michigan. At some point, Constance landed in New York and found work there as a theater receptionist (have no idea which theater). 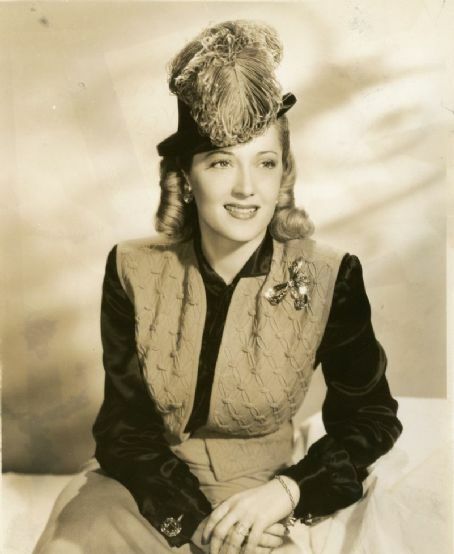 Constance was signed to a term contract with MGM after talent scouts spotted her in a New York night spot in 1943. 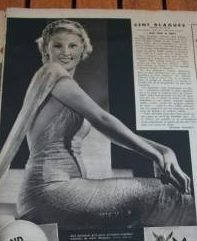 Connie signed with MGM, the most prestigious studio at the time, and made her debut in 1943 in The Man from Down Under, a Charles Laughton movie. In many ways, it’s a typical wartime propaganda movie – on the other hand, in many ways it’s not a typical propaganda movie. What makes it stand out, if only so slightly, is the fact that it deals directly with Australians and their bit in WW2. Tell me named of three movies about Australia from the golden age of hollywood. You see, hardly any springs to mind. Constance’s second movie was the more prominent I Dood It, a Red Skelton comedy classic. Constance then made a string of well-regarded musicals – Broadway Rhythm and Bathing Beauty. No story, little character development, lots of singing and dancing. Constance returned to propaganda movies with This Man’s Navy, about U.S. Naval Airships (Blimps) and featuring Tom Drake, who for a time seemed like the hot new thing then faded quickly into obscurity. 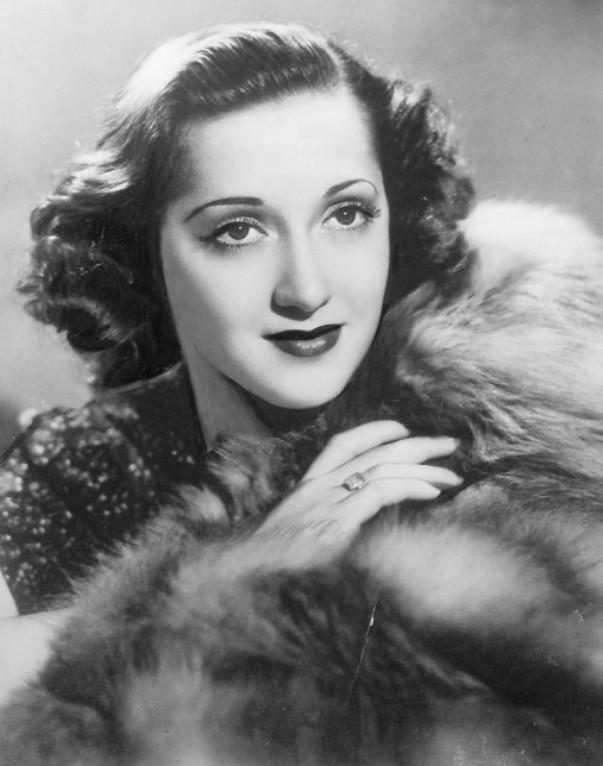 During this time, Constance was featured in several movies by the great but troubled actor, Robert Walker – The Clock (a superb, intimate drama with Walker and Judy Garland), Her Highness and the Bellboy (a so-so musical about a princess, played by Hedy Lamarr, and the unrequited crush the hotel bellhop, played by Walker, harbours towards her). In 1946, the war was over and Constance’s career entered a new phase. Her first post war movie was Up Goes Maisie, a continuation of the adventures of brassy showgirl Maisie (played by Ann Sothern). Constance continued appearing in high quality movies that never hit top-tier. Meaning, she never acted in a movie that ended up a classic, but she did work in solid movies with a solid if sometimes phenomenal cast. Such two movies were The Hoodlum Saint, a morality tale about a WW1 vet (played by William Powell) who will do anything to get rich (and the consequences of his actions) and Two Smart People, an unusual noir romance film, directed by Jules Dassin and headed by John Hodiak and Lucille Ball as two con artists in love. Constance had a minor role (literary) in The Beginning or the End, a docudrama about the atomic bomb (and again shared the screen with Robert Walker). Constance’s last movie made under the MGM helm was The Romance of Rosy Ridge, perhaps the most superior film of the post-war lot. Why? Well, for one thing, it deals with subjects that Hollywood often tended to avoid – the post-war animosity and hatred that still burns deep in the people. While it was made post-WW2, the plot is set after the American civil war, and illustrates nicely how people lived in Missouri in the mid 19th century. it’s surprisingly authentic for a Hollywood production of the 1940s, and despite a few song and dance numbers, never falls into the sappy/sweet routine. The leads are played by the young, fresh-faced Janet Leigh and Van Johnson – a good combo! I guess Constance went freelancing, but appeared in only two more movies – a great one and a sadly lukewarm one. The great one was The Asphalt Jungle, a top-notch heist film, dark, gritty, intense, one of the best movies John Huston made. The lukewarm one was Three Guys Named Mike, a fluffy and brain-dead rom com with Jane Wyman as a stewardess who has to choose between three guys named Mike. It’s much better than most rom-coms today, mind you, still not enough to warrant a second look. And that was it from Constance! Constance Weiler, on the set of “The Postman Always Rings Twice,” telling John Garfield and Leon Ames the thrill of flying one’s own plane. After six weeks, she’s just made her first solo hop. The payoff is she can fly a plane but doesn’t yet know how to drive an automobile. Funny, she never appeared in the movie, at least it’s not among her credits. Constance’s career effectively ended in 1947, although she did bits and pieces afterwards, from 1946 onwards, there were no mentions of her in the papers. Next thing we know, Constance married Douglas la Franco on June 7, 1957, in Los Angeles. Her career had been over for almost a decade by then, and she was consistently out of the limelight. Anyway, La Franco was born on September 25, 1929 to Ceferino la Franco and Edna Pullion. His father was from the Phillipines, his mother from Oregon (what a combo!). He grew up in California and was never married before he wed Constance. Unfortunately, the marriage lasted a very short time, and they divorced in 1959. They did not have any children. In 1960, Douglas married his second wife, Pearl Colberg. Constance did not remarry and lived for the rest of her life in San Francisco. Constance Weiler died on December 10, 1965 in San Francisco, California. Constance’s former husband, Douglas la Franco, died in 2006.